In addition, if an explosion occurs within the powder handling equipment and it breaches the envelope, these standards offer little guidance regarding the potential impact that vented explosions (e.g. explosion pressure) can have on neighboring equipment and structures. The prevailing dust explosion risks in powder handling facilities are dependent on a variety of factors including: process parameters (e.g. flow speed, pressure, and temperature); equipment properties (e.g. the presence of moving elements and associated mechanical strength); dust explosivity and ignition characteristics (e.g. explosion severity minimum ignition energies and temperatures); and mitigation measures, which include housekeeping and protective measures. 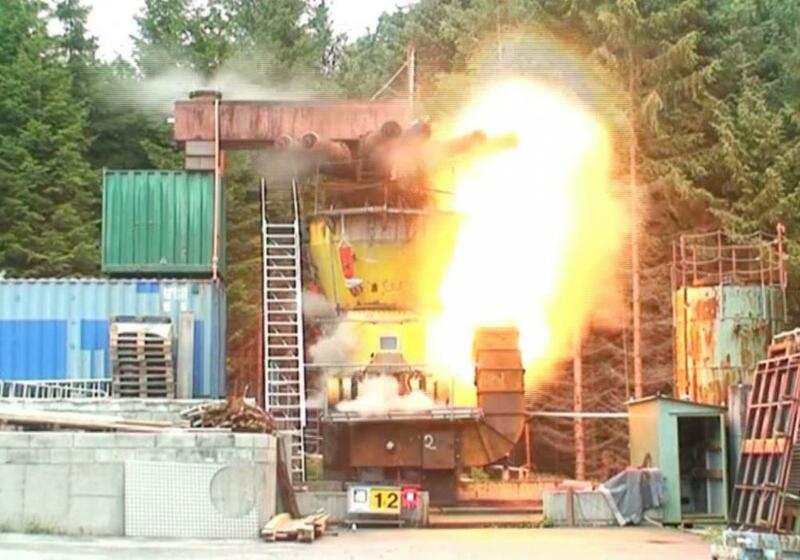 Given the critical nature of protective measures to mitigate dust explosion consequences, the myriad of design options of dust and powder handling equipment, and international standards requirements, meeting the intended safety levels required by international standards can be challenging especially for complex equipment designs or external damage assessment. So how can we accurately account for all this complexity to meet safety and standards requirements? One answer is to perform large-scale experiments that can be used to validate the protection capabilities of a given device, and the other is advanced computation fluid dynamics (CFD) modeling with tools that have been developed to help understand such complex phenomena. Figure 1 shows an example of a CFD simulation of complex explosion development and venting on a silo. Figure 2 shows large scale experiments to determine adequate explosion protection for complex explosion developments within a coal mill. Some examples are provided where such experiments and CFD studies can provide useful insights beyond those outlined in safety standards. NFPA 68 Standard on Explosion Protection by Deflagration Venting gives guidance on the proper vent area to reduce the maximum possible overpressure (Pmax) within a confined vessel, which is typically around 8 barg (60 psig) for common dusts, to “reduced” values (Pred) to ensure the vessel maintains structural integrity during an explosion. For example, consider a facility that had two vessels that were both rated to 0.5 barg (7 psig) and each vessel had the proper deflagration vent design per NFPA 68 to reduce maximum explosion pressures to Pred = 0.5 barg (7 psig). If these two vessels are independent or isolated as required by NFPA 68, the reduced explosion pressure in each vessel should be no greater than the rated pressure. Figure 3 shows CFD modeling results of the flame propagating through the vent openings at the top of the vessel, along with the pressure buildup during this process. As the results show, the implemented vent area significantly reduces the explosion overpressure to within the design pressure of the vessel, which was 0.5 barg in this example. Figure 3: Deflagration venting for two separate vessels designed for Pred of 0.5 barg (7 psig). The colored sections in the upper images are the flame front and the colormap in the bottom images gives the maximum overpressures (see scale to the right). However, if the two vessels are connected via a 4-in. duct pipe, the venting correlations developed in NFPA 68 for individual vessels no longer apply. For example, if the same two vessels individually designed with deflagration vents for Pred = 0.5 barg (7 psig) were interconnected, the pressures would exceed the design pressure of the vessels. Figure 4 shows that as the flame is ignited in the leftmost vessel, the right vessel becomes pre-pressurized prior to the arrival of the flame in that vessel. This leads to pressure piling and results in significantly higher vessel pressures over 3 barg (45 psig), significantly higher than the design pressures of Pred = 0.5 barg (7 psig). Figure 4: Deflagration venting for interconnected vessels, each individually designed for Pred of 0.5 barg (7 psig). The upper images of the vessel show the flame front and the lower show a colormap scale of the maximum overpressures (see scale to the right). Ignition is in the left vessel. The right vessel is pre-pressurized prior to the flame arrival which results in pressure piling and pressures greater than 3 barg (45 psig) in the second vessel. Therefore, if a given system comprised of two vented interconnected vessels of 4 and 20 cu m, does not allow for explosion isolation, it may be necessary to evaluate the potential risks and determined if pressure piling can occur. System designers or facility operations can perform experiments or advanced modeling using CFD to help understand the potential explosion consequences and ways to protect against any hazards. Figure 5 shows the results of both experiments and CFD modeling of such a system. 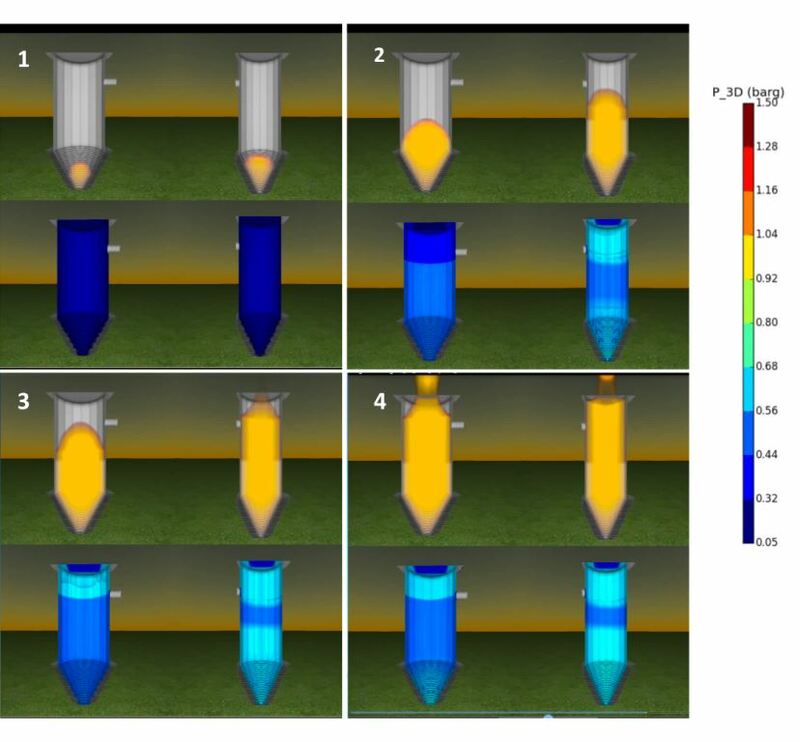 Figure 5: Experimental explosion development in interconnected vented vessels (upper images) compared to simulated results using CFD (lower images). Left image is prior to ignition in the larger vessel and right image is after flame venting from both vessels. While some limited guidance exists regarding thermal exposure caused by a venting deflagration or explosion from process equipment, detailed pressure loading on external structures and equipment cannot be accurately evaluated using simple models. CFD explosion simulations provide a means of evaluating the complex pressure waves exiting the vessel and impacting the neighboring buildings and structures as well as evaluating potential access restrictions and operating procedures to improve health and safety of personnel. 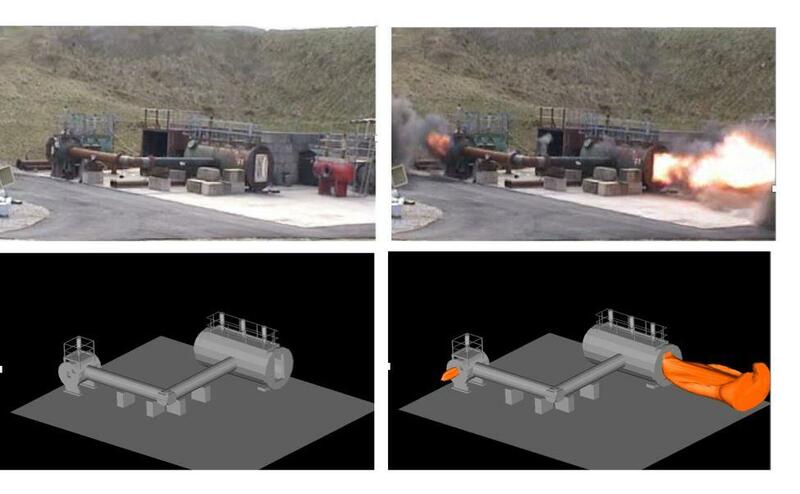 Figure 6 shows an explosion modeling simulation of a grain silo, whereby the flames exiting the silo are evaluated to ensure proper access limitations for personnel in addition to determining the high-pressure loading (in red). Using this data, buildings can either be reinforced or equipment can be relocated to ensure that sections of the building and equipment are not damaged. 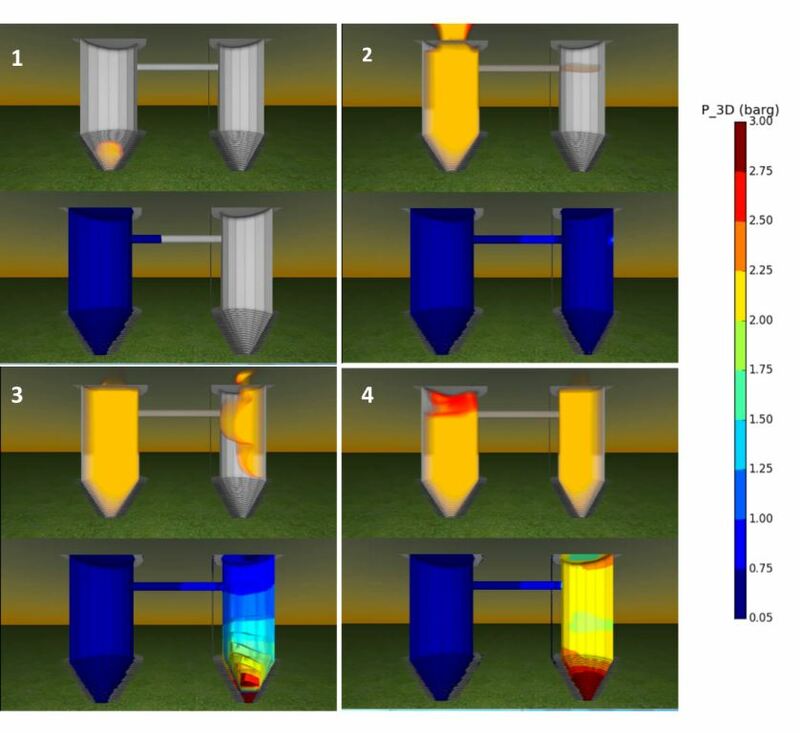 Figure 6: CFD simulation of external explosion effects from an explosion in a grain silo. This includes thermal and pressure damage. Figure 7: CFD model of a complex dryer and cyclone assembly. 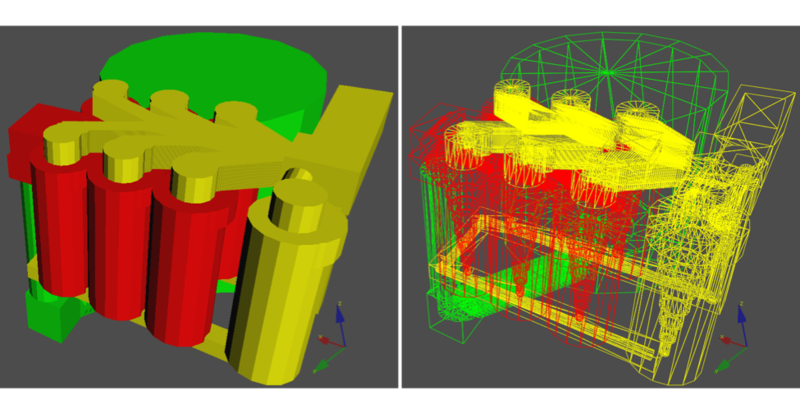 Left image shows the external geometry, while the right image is a wire frame rendering showing the internal aspects of the assembly. In addition, if a facility wanted to raise the vent duct exhaust on a dryer system outdoors to ensure safe passage for personnel, then the modifications to such a complex system need to be evaluated. CFD simulations, shown in Figure 8, can evaluate the effects of raising the vent duct above the ceiling of the first floor and verify the reduced maximum pressures within the dryer remained acceptable with the new routing of the vent duct. 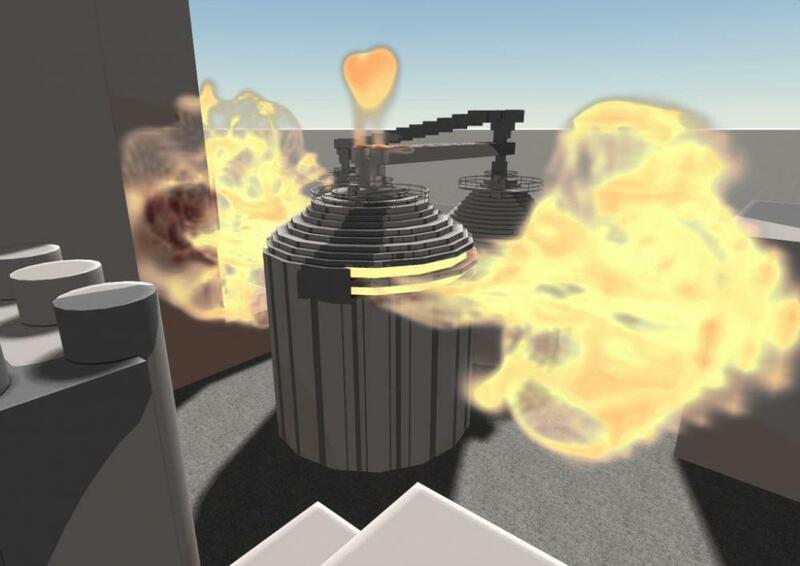 This simulation confirmed that the design modification ensured the same level of safety for the dryer in the event that an internal deflagration occurs. Figure 8: Dryer vent design study. 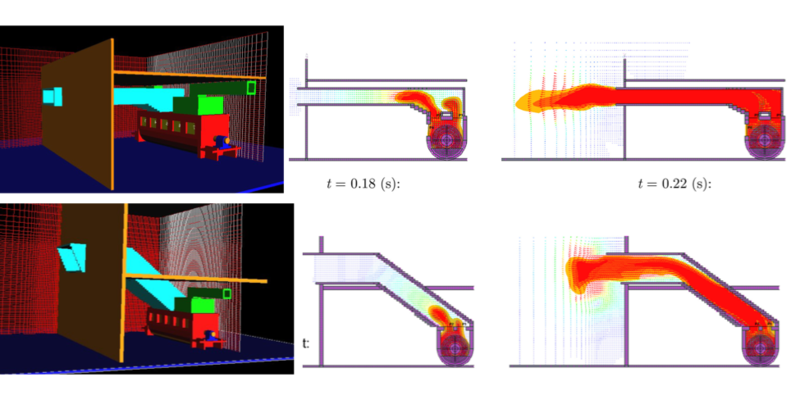 CFD simulations to evaluate the changes in explosion pressures if the vent duct were raised above the first-floor ceiling. Effective protective systems are a critical part of mitigating the consequences of dust explosions and are required by U.S. and European standards. Considering the wide range of factors that affect dust explosion risks in powder handling facilities, simple tools and correlations are at times insufficient for addressing real-world situations. Realistic experiments or advanced CFD analyses can be an invaluable tool for engineers designing powder handing plants as well as those evaluating protective systems for performance based design criteria. These tools can accurately account for and optimize advanced protective systems such as venting devices, suppression systems or explosion barriers used for isolation. Experiments and CFD analyses can also be used to help ensure the level of safety when utilizing performance based design options outlined in safety standards. At times, however, large scale-experiments can be cost prohibitive and CFD is a more practical option to evaluate the explosion development in complex systems. Dr. Scott Davis, PE, is president – principal engineer, Gexcon US. For more information, visit www.gexconus.com.